One of the benefits of buying recent versions of Delphi, C++Builder and RAD Studio is getting access to earlier version licenses and downloads at no extra cost. Most older version licenses are available back to Delphi 7 and C++Builder 6 and the downloads are available with purchase of Professional edition and higher. Visit the RAD Studio Previous Versions page to see what's available. 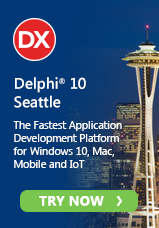 Delphi XE5 users get access to earlier Delphi licenses. C++Builder XE5 users get earlier C++Builder licenses. RAD Studio XE5 users get access to them all. These offers are available for a limited time. Time is running out for XE3 users who must redeem any earlier version licenses by March 2014. The free licenses are registered to the same user and can't be transferred.